In April this year I received an invitation to an Institute of Policy Studies and Lee Kuan Yew School of Policy Studies Conference held to mark SG50 entitled “What Lies Ahead”. Predictably the State academics organising the conference anticipated no surprises in what lay ahead, as shown by the Conference line-up. The Institute of Policy Studies and the Lee Kuan Yew School of Public Policy, National University of Singapore (NUS), invite you to a conference to mark Singapore’s Golden Jubilee and NUS’ 110th anniversary. Titled “Singapore at 50: What lies ahead?” (SG50+, in short), the conference will take place on 2 and 3 July 2015 at the Shangri-La Hotel. International and Singaporean thought leaders will discuss geopolitical, economic, environmental and governance trends that may affect the future of our world, and shape how Singapore and Singaporeans can be future-ready. 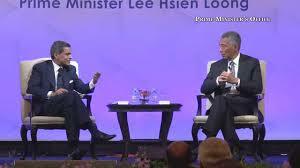 Prime Minister Lee Hsien Loong will be the Guest of Honour at the conference gala dinner and dialogue on 2 July. The dialogue will be moderated by Dr Fareed Zakaria, the host of Fareed Zakaria GPS on CNN. The conference programme on 3 July includes a lunch dialogue with Deputy Prime Minister and Finance Minister Tharman Shanmugaratnam, and a discussion on the topic of governance between Emeritus Senior Minister Goh Chok Tong and former UK Prime Minister, Sir John Major. We hope to host up to 700 public, private, community and student leaders at the conference. We would like to personally invite you to register to attend the conference. Registration details are in the column on the right. We look forward to you joining us at this special event. You have managed to arrange a programme without one Singaporean speaker outside the Government and the PAP. The nearest parallel would be a conference hosted by the Soviet Union in 1989 with only speakers from the Communist Party invited. We will not be attending particularly as you have the effrontery to charge $1500 to hear PAP propaganda that I can read in the State media every day. Apparently the PM, who was undoubtedly given plenty of time for his researchers and media specialists to prepare his answers for him, was not referring to traditional notions of aristocracy but to the concept put forward by Thomas Jefferson, one of the authors of the US Constitution and a founding father and President of the young United States. Jefferson may have been a hypocrite, since he owned slaves and had an intimate relationship with a female slave while “continually puling about liberty, equality and the degrading curse of slavery” as Lincoln put it. However, while remaining central to the US system of government, the concept of inalienable rights and liberty is something that was quickly jettisoned by the PM’s father after he seized power. The rights conferred by our Constitution are so limited by sweeping exceptions that they are not rights at all and our Executive feels free to ignore the Constitution or amend it whenever it suits. However LHL is talking about something very different. Whereas Jefferson says the electorate are perfectly capable of choosing the best rulers, LHL displays the familiar mistrust of democracy and the will of the people that his father displayed and that defines the PAP. When the PM talks about people being respected because they have earned it, when he worries about everything being levelled down to the lowest common denominator and society losing out leading to anarchy we just hearing the same self-serving message that the PAP have always put out. This is: we are the “natural aristocracy” but we cannot trust you the people to make the right decisions and elect us to office if we hold free elections. Therefore we will continue to tilt the playing field so that we and our friends will stay in power indefinitely. We will exercise complete control of the media and of the Elections Department. We will clamp down on freedom of expression and dissent to instill a climate of fear, that we wll euphemistically call “respect”, through the persecution of bloggers like Roy Ngerng and children like Amos Yee. We will use state resources, such as housing and control over CPF to intimidate you. If despite this, you dare to elect anyone who challenges us we will have them removed from Parliament on fabricated charges. After ensuring that no opposition can emerge to challenge us we will have the arrogance to claim that we are a natural aristocracy and the only people fit to lead the country. Once we have succeeded in silencing all dissenting voices then we will give the impression to foreigners through orchestrated events like this conference that Singaporeans are solidly united behind their “natural aristocracy”. Why Do the Greeks Resoundingly Reject Austerity Yet Singaporeans Embrace It? Singapore is neither an aristocracy nor a democracy. It is a plutocracy and a marriedtocracy. Good article – there are truths to be found there. And plenty.